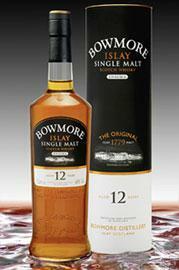 Bowmore Whiskey – Islay Single Malt Scotch Whisky 12 Year Old. As you would expect the distillery is situated on the shores of Loch Indaal on the unspoilt and stunning Hebridean Isle of Islay. A more beautiful and tranquil place I have yet to find. Yes, we agreed that we did look forward to this tasting, and were not disappointed. Colour:- a rich amber, turning to a warm gold with the addition of some water. Nose… heavy, robust, perfumed smoke, but with water turns to a malty-peatyness and is much sweeter. 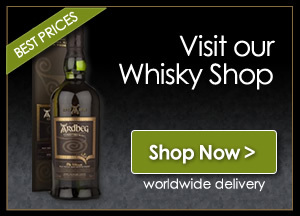 Taste… rich, peat and perfumed leather. Finish… an aftertaste of peat,fire and smoke fills the mouth. Nose... sweet peat and lightly floral. Taste… smokey with fruit and the slightest hint of chocolate. Finish… long, delicious with a lasting peat sweetness. Dougie loves it, would eventually like to go through the full Bowmore range past, present and those drams still to come our way. Jim, that’s a different story, Islay Whiskies and all other things Islay can do no wrong in Jims eyes, he really enjoyed his tasting of the 12 year old, he did not expect it to be anything other than superb and it was. During this tasting Jim and Dougie got to think, on Saturday November 29th we are going to try something new to the Whisky Boys, a guest taster together with a head to head taste test. We are looking forward very much to this little venture. The regular tasters will be there, Jim, Dougie and Nicola together with a local businessman a Mr Dougie Bell who will be the Whisky Boys first guest taster. For the head to head challenge Dougie wished that we could put Bowmore’s Mariner up against Bruichladdich’s Rocks, so this will be our head to head on Saturday, canny wait!! Jim could be in trouble here an Islay against another Islay, may the best dram win. So this little evening will give us two tastings a guest taster and a winner on the head to head. If this is successful we shall certainly repeat it but with different tasters and of course different drams. If anyone out there has any suggestions for a head to head challenge, let us know and we may be able to accommodate.